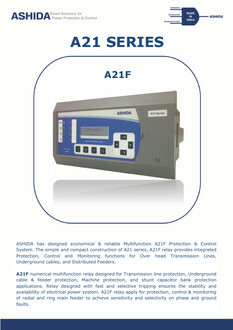 We take this opportunity to introduce ourselves as ASHIDA Electronics Pvt. Ltd. We are prime suppliers of Numerical Protection Relays, Control & Relay Panel (C&RP) and Supervisory Control and Data Acquisition Systems (SCADA). 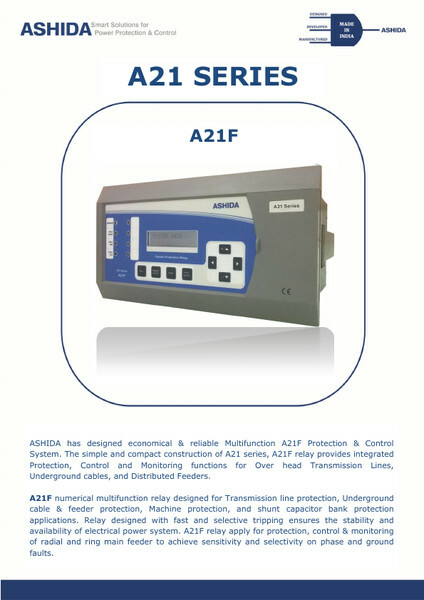 ASHIDA have a very rich experience, of more than 45 years, in power protection solutions and supported with very strong “In-House R&D” team for existing and new products. Our R&D house is equipped with the latest state-of-art Technology and it is recently recognised by Ministry of Science & Technology, Central Govt. of India. We have also received an appreciation award from the Vice-President of India for our indigenous Research & Development efforts on Numerical protection relays. We have executed more than 160 projects on SCADA system and supplied approximately 10,00,000 Ashida relays in the major electrical installations in 18 countries across the globe, which includes Australia, Mexico, France, Italy, Philippines, Saudi Arabia, Turkey, Malaysia, U.A.E. etc. Please also note that Saudi Electric Company & Utility of Abu Dhabi have qualified and approved our Protection Relays for regular deployment in their various projects. Our indigenous products are well recognised and being used by all the major Indian Utilities and Original Equipment Manufacturers (OEM) like ALSTOM, SCHNIDER, ABB, BHEL, SIEMENS, etc. We also have 70% share in Indian Railway Protection Units & Automation Systems.